Gallery WYSPA, Gdansk. Gallery Amfilada, Szczecin. In the quest for the mythical land of happiness mankind tends to direct his desire either towards some indefinite space, at theoretical models of perfect social structures, or he invests his longing in compensatory day-dreams. Alternatively, in an attempt to create a place on earth in the calm and peace of the hearthside, he idealizes the notion of a refuge isolated from the dark forces controlling the world. The sphere of domestic rituals, life in the midst of a tangle of interpersonal relations, and the socially accepted image of the ideal family in confrontation whit reality are Petter Hellsing`s areas of interest. Abandoning the traditionally understood privileged forms of artistic expression Hellsing resorts to a world of objects which have been degraded into acting as dumb witnesses of daily life. 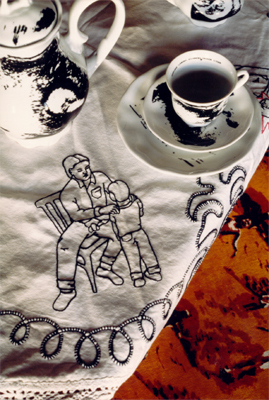 He projects ambiguous images onto tea cups, jars, and traditional embroidered tapestries – scenes from family life, the fatalistic cycle of existence from the moment of conception through subsequent social, sexual, and emotional initiation sequences, to embroidered scenes from driving lessons, football team portraits, and scenes showing the first attempts to correctly apply a condom. This peculiar assortment of images is as idiosyncratic as it is universal. Hellsing presents a cycle of life in its inevitable course from cradle to grave, of life being played out in the context of family relations and shameful mundaneity, in a family guaranteeing a sense of security, whose main aim is supposed to be the creation of an exclusive space which positively stimulates the process of a child’s intellectual and emotional development. This idealist model collapses in the face of the complex and ambivalent family relations played out between a mother and her unborn daughter, and between, a father and his adolescent son. Stimulation of juvenile sexuality in association whit manifestations of paternal authority, raising the problem of sexual abuse of minors and sexual initiation, carries us into an area which has been rejected from the collective consciousness and which manifests itself in the symptoms of the Oedipus complex. The ambivalence of relations between children and their parents is at odds with socially approved models and thus gives rise to anxiety and tension. Hellsing`s work seems to be a process of self-enlightenment concerning the structure of inter-personal relations and simultaneous subjection to the inferno of daily life with its tempting beauty. Hellsing`s hero does not contest the principles of the world opening out before him, but involves himself in that world out of some painful necessity. The idealistic notion of the home as the ´good place´ is disrupted by taboo subjects; death, violence, abortion, sexual abuse, and in the atmosphere of Hellsing`s work childhood becomes a rather disturbing phenomenon which provokes us with its pressing ambiguity. The dependence relationships and subtle episodes of family violence become intermingled with manifestations of affirmation of life and calm acceptance of its principles. 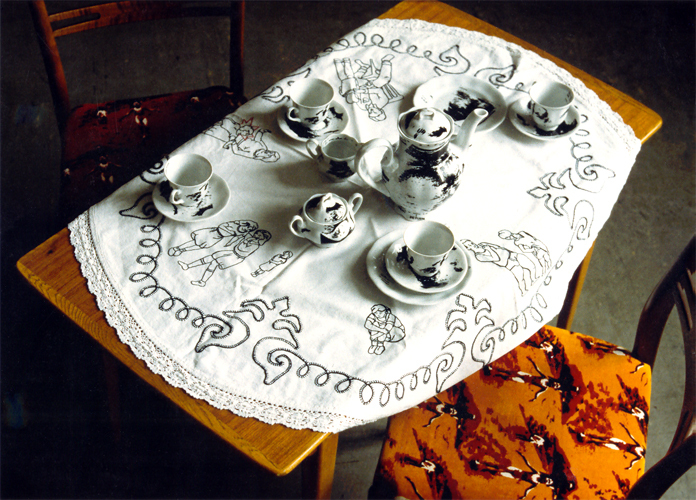 The atmosphere of traditional patriarchal family relations evokes the all but forgotten embroidered tapestries and tablecloths, which are a nostalgic attempt to represent human toil, dedication and attachment to the hearthside, whilst creating an ideal image of it. In one visual communication hellsing includes two powerful oppositions; the notion of an ideal refuge, consciously upheld to maintain internal stability, and the home as an arena for the struggle between different forces, a space for the exercise of restrictive parental authority and the manifestation of rigidly established social mores. Awareness of the fatalistic nature of biological conditioning and the consequences of social integration is accompanied by a powerful fascination with life and its processes.Danger is accompanied by shudders of delight, conception is accompanied by fear, and every stage of life’s development is accompanied by the presence of death. 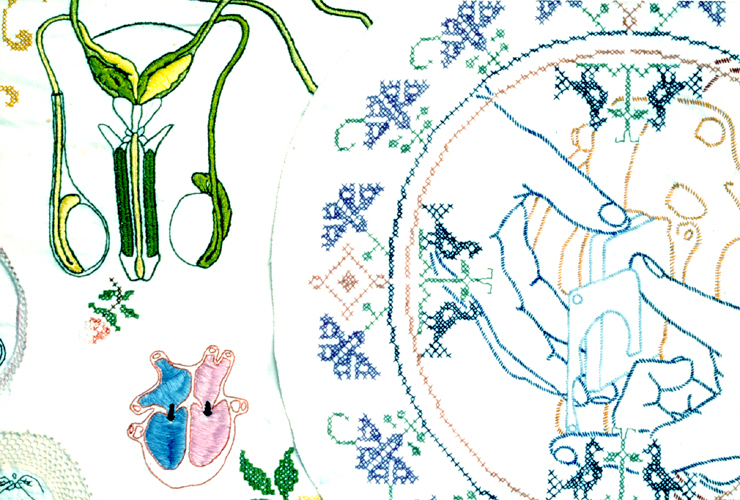 Tablecloth embroidery. Chairs screen on velvet cloth. Coffee set screen print.